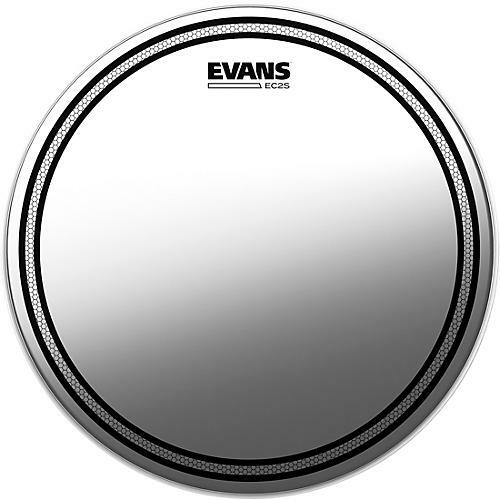 Evans EC2S Frosted Drumhead 13 in. The Evans EC2S Frosted Drumhead offers an edge control ring mounted under 2 plies of 7-mil film. The EC2S coated drumheads control vibration instead of eliminating it. It also dampens higher overtones, enhances low-end attack, and supports a broader tuning range. Evans improved EC2S drumheads contain Evans' exclusive Sound Shaping Technology (SST). Sound Shaping Technology allows the drumheads to be fully optimized for each individual size by varying the thickness and density of the damping material, ensuring greatly improved performance and tone across the entire kit. Unlike other heads that lack SST, Evans EC2Ss contain the ability to balance attack and tone for each size. The result is a drumhead series fine-tuned for attack, tone, length of sustain, and ease of tuning. Packed with a more balanced and pre-EQ'd sound across the full kit, the vans EC2S with SST will make your toms sound better than you ever thought possible. "So I just gave the new EC2s a test run overseas. They sound great!! I used them on a Mapex Orion kit. The new muffling rings are nice! After pounding these for a few shows they stayed focused." "The new EC2s are so incredible! The attack and tone has somehow been magnified, when I'm playing these heads the feel, definition and tone that I'm able to draw out of them is amazing and is so sweet to the ear." "The new Evans EC2 SSTs are amazing. My toms sound so warm and lush. These drum heads bring out the true sound of the drums." "The best just got better - the new EC2 SST drumheads are incredible!"